As we enjoy yet another snowstorm this winter of 2018, thoughts of Spring are starting to sneak into my mind. It started when I noticed it was still light outside as I started dinner the other night, and then I noticed that the sun was up when the alarm went off this morning. I must admit I like winter. I am an active hibernater. I like dressing in cozy layers, soft sweaters and wide wale corduroys. I like how clean everything on the farm looks when it is blanketed in a layer of pristine white snow and I just love the hearty stews, soups and roasts centered on the hearty root vegetables and brassicas available to us locavores. Being a locavore – someone who eats what is locally grown and in season — is mandatory for us. 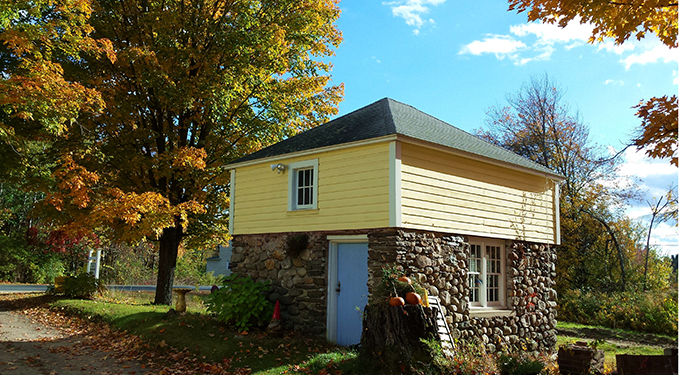 As owners of Yellow Stonehouse Farm, John and I must “walk the talk”. 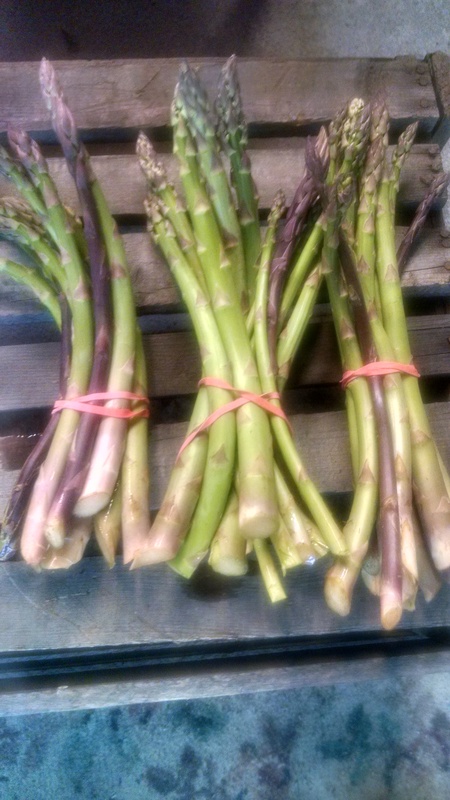 After all – we expect our CSA members to eat what we grow when it’s harvested, or in the case of our Winter Share, when we distribute from winter storage. So of course, we do the same. Thankfully, it’s a pleasure because these vegetables are the basis for the warm and comforting dishes we love to eat when its’ cold and blustery outside. As I write this, I have a delicious stew of veal, onions and carrots simmering away for dinner tonight. I enjoy knowing we are eating vegetables that are grown locally, organically and are good for us because these are the vegetables that are meant to sustain us during the cold times – as our ancestors did back before commercial growers starting shipping vegetables around the globe. I think it’s healthier to eat what’s available to us based on the calendar – during winter, we eat carrots and potatoes, turnips and Brussel sprouts which contain the nutrients we need now to stay healthy. 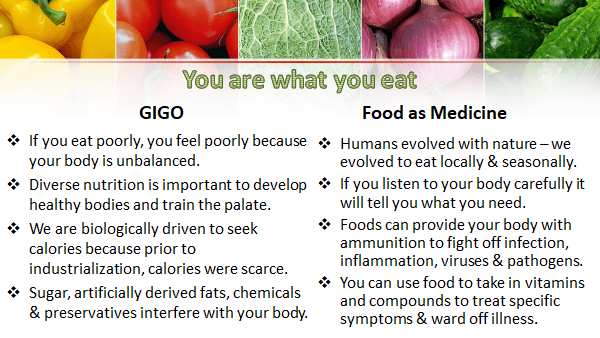 Eating healthy foods, specifically vegetables, is one way to maintain our health and well-being. Processed food have so many chemicals, additives, salt and sugar that they aren’t healthy for us. We’re not vegetarians but we eat lots of fresh produce and strive to make sure that at least two thirds of every plate are vegetables or fruit. How? Well, by adding vegetables to sandwiches, eggs and other dishes, and it’s easy to cook extra’s to add cold later to a salad. 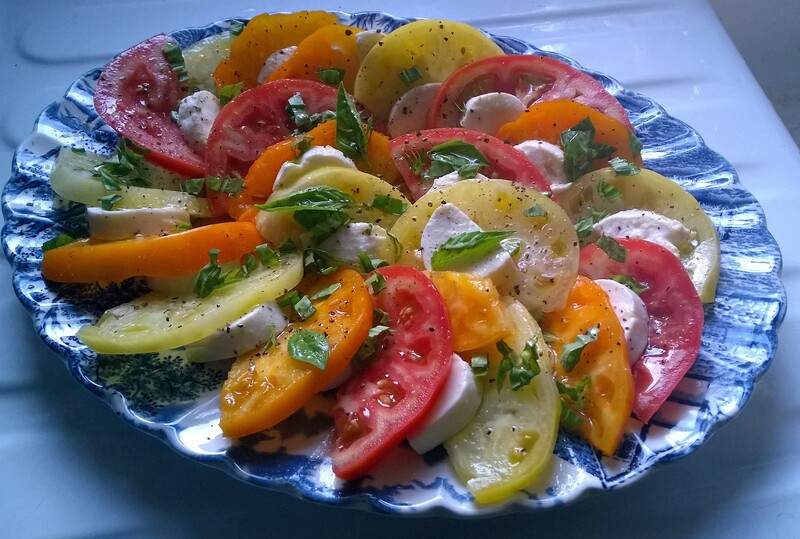 I also harvest and dry herbs to make herb mixtures to add to recipes and even a healthy salt free salad dressing mix for homemade salad dressings. 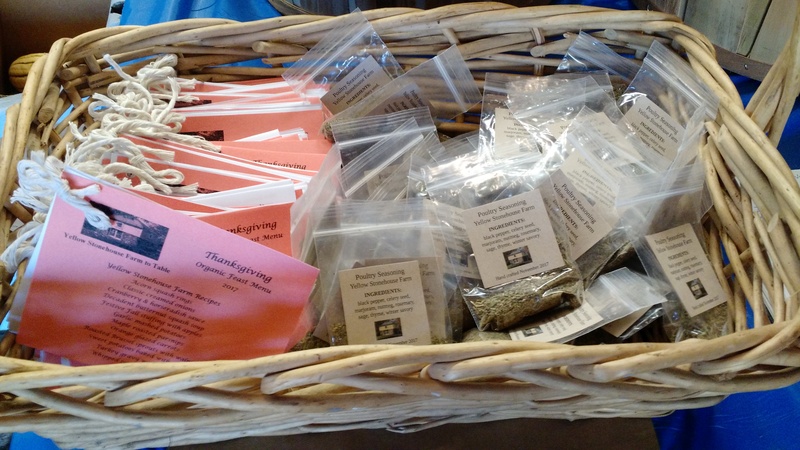 All of these spice mixes and salad dressing mixes are offered to our CSA members so they can experiment as well. 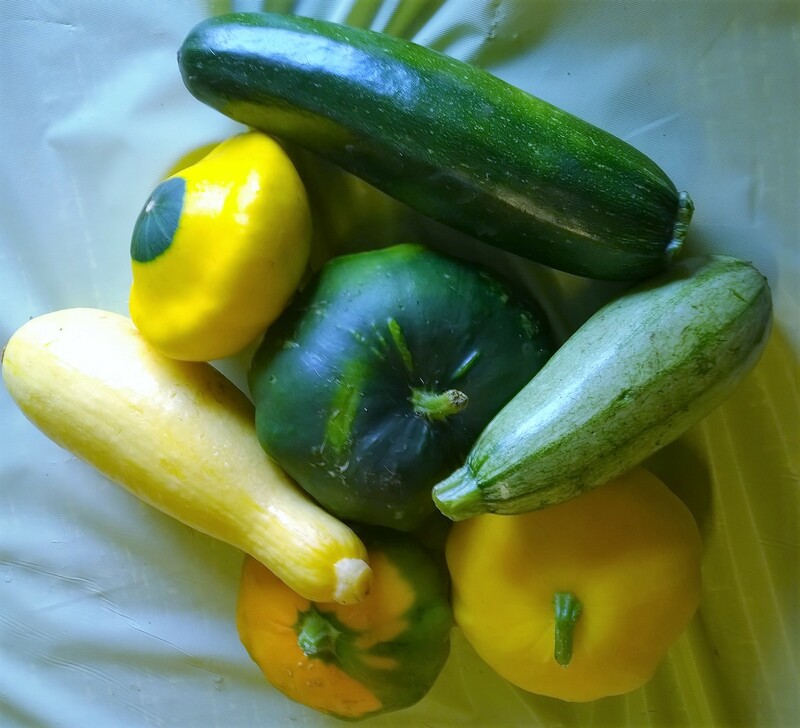 Sharing recipes and ideas on how to cook the many vegetables we offer CSA members is an integral part of what we do at Yellow Stonehouse Farm. We know many of our members aren’t familiar with some of our produce, so we provide them the help they need to take full delicious advantage of their farm-share. 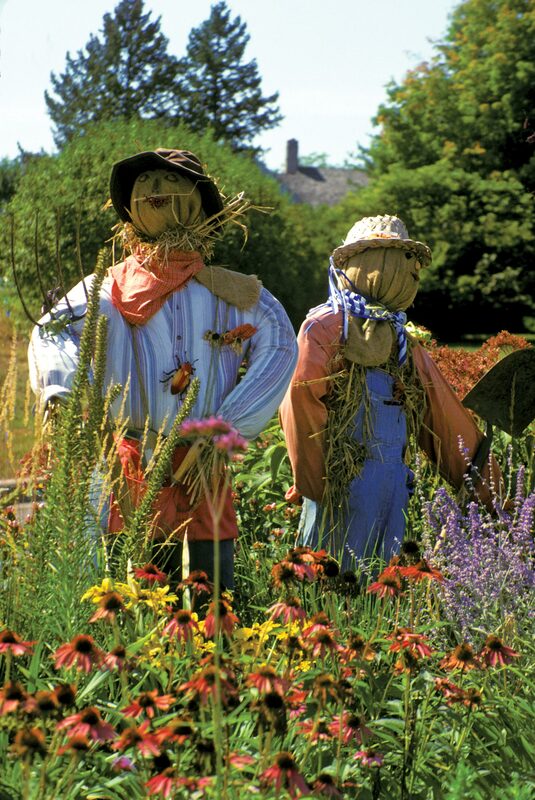 But still, we entertain ourselves with thoughts of Spring and what we are going to grow next season. Reading seed catalogs is fun – we peruse seed catalogs and learn about new varieties of vegetables to offer our 2018 CSA members. We look for new varieties that offer different colors and tastes as well as new hybrids that are bred to be more drought pest, and disease resistant – so that we can continue our organic practices of avoiding the use of pesticides and herbicides and continue to offer the highest quality organic fruits and vegetables to our CSA members. 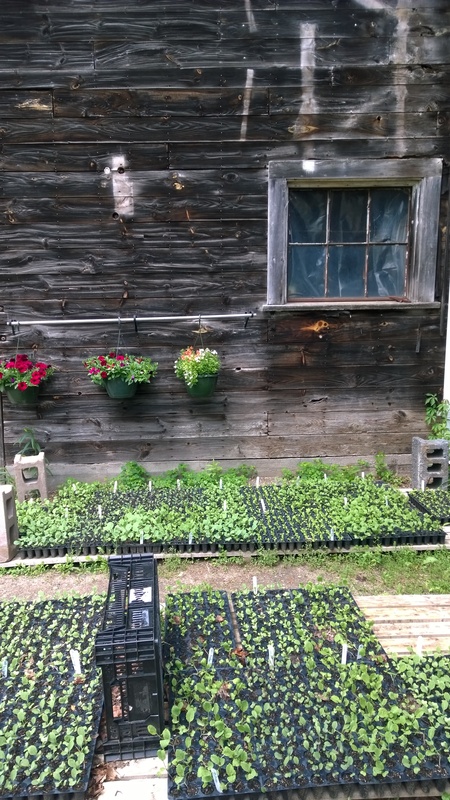 Just a reminder – membership applications for Yellow Stonehouse Farm’s CSA 2018 Summer share are now available. 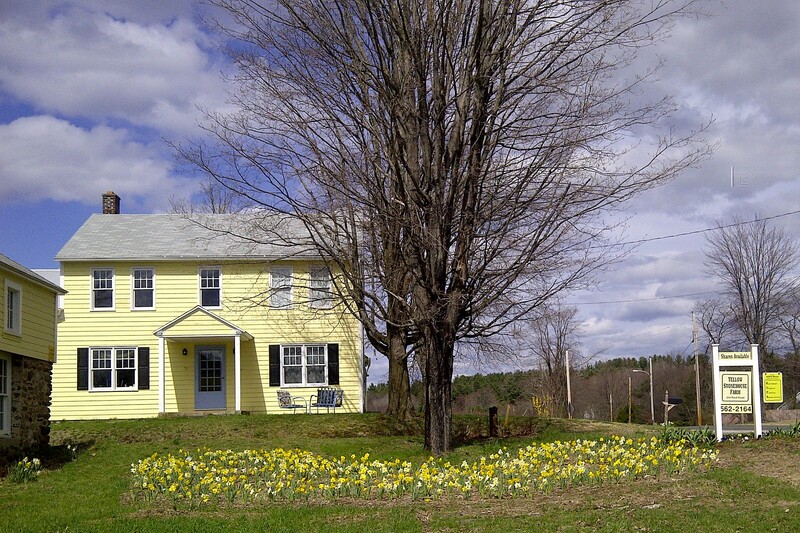 Yellow Stonehouse Farm is an Organic Farm and CSA located on the Westfield-Southampton border, which is part of the Eastern Farms section of Westfield, MA. Historically a Dairy Farm operated by my husband John’s family (the Hutkoski’s) and their predecessors back to the early 1800’s, John and I took over the farm in 2009 and opened the CSA in 2012. Today, we have a thriving USDA certified Organic CSA whose members enjoy the farm’s fresh vegetables, herbs, & flowers from June – February. A CSA is a way for consumers to buy local, seasonal produce directly from a farmer in their community in the form of a “farm share”. 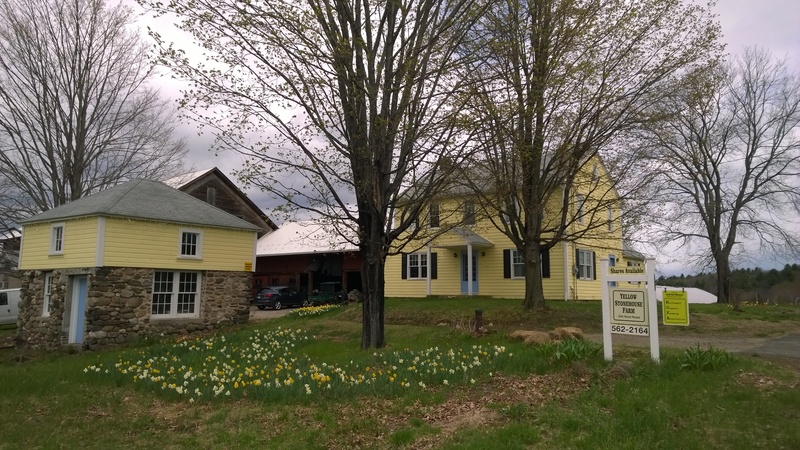 Yellow Stonehouse Farm offers a limited number of “shares” to the public so that they may share in the bounty grown on the farm’s cultivated fields. 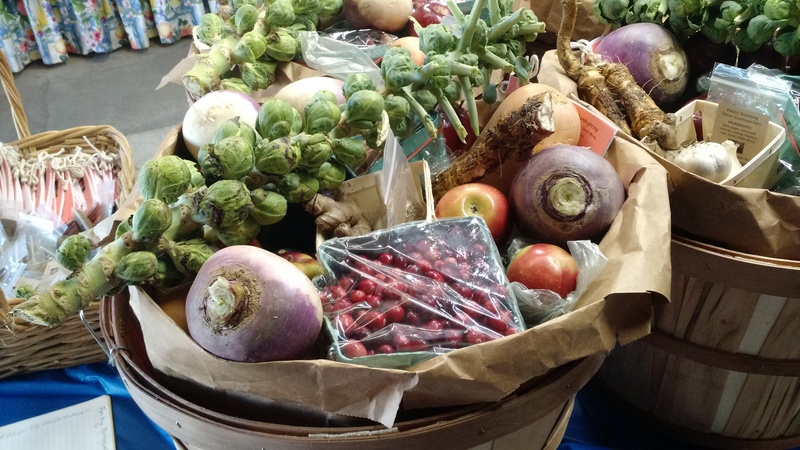 CSA members buy a share of the farm – and in exchange, during the growing season, members receive abundant shares of local, fresh, and seasonal produce directly from the farm at an affordable price. When John and I first took over the farm in 2009, we spent a lot of time on a Farm Plan that would allow us to continue the farm as an agricultural enterprise – keeping the farm a farm for the long term – as well as selecting the best way for us as a couple to take on the work of the farm in a way that kept us happy, healthy and able to support the farm. 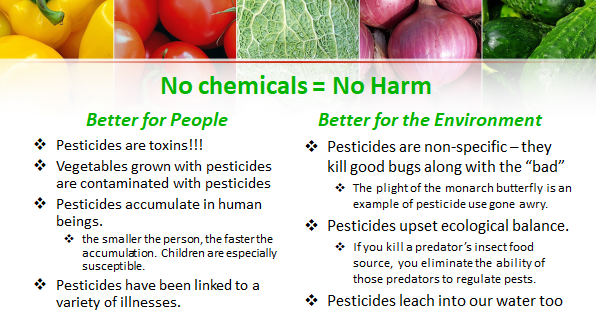 Healthy Living was one of our most important goals – and from the very start we decided we weren’t going to use any unwholesome pesticides, herbicides or fertilizers. We both grew up in family farm-based and chemical free agricultural communities and felt that doing so led to our overall good health, which we didn’t want to squander using chemically dependent farming practices. Besides, we both loved wildlife and didn’t want to hurt any of the other residents on our land such as the birds and bees, beavers, bobcats – and turtles! 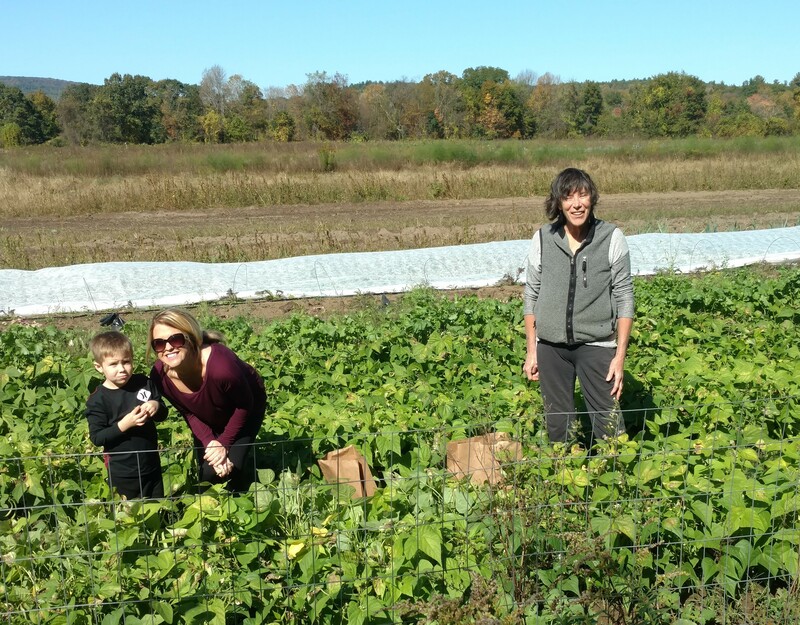 Happily, we found the CSA model of farming and were able to complete the USDA approved Organic Certification process in 2015 to become Hampden Counties’ first, and to this day – only, USDA Certified Organic Vegetable Farm and CSA. As we’ve became more involved in Yellow Stonehouse Farm we have pursued many educational opportunities – I completed an eight-month farming program and we’ve both attended seminars and classes offered by NOFA – the Northeast Organic Farming Association and MDAR – the Massachusetts Department of Agricultural Resources. I feel lucky to be able to pursue my life-long interest in growing and using flowers and herbs for both culinary and medicinal use, which help me to develop the healthy and delicious recipes that go together with the the CSA shares each week. What is more interesting, however, is how popular Healthy Eating has become throughout our local community, the Pioneer Valley. Of course, Western Massachusetts has been a leader of the Organic Food and CSA movement since the 1960’s – and we are blessed to be part of today’s healthy eating movement in Hamden County, contributing to our communities’ well-being. We are committed to providing a healthy start to our communities’ children and families. Research shows that eating Healthy Nutritious food contributes to the positive physical and cognitive development of children and prevents the onset of disease – both in childhood and adulthood. Research and our experience has been that children who are exposed to the farm and farming practices, learn where their food comes from, how it grows, end up eating and enjoying vegetables earlier and then for the rest of their lives. Plus having children enjoying the farm is a great joy and keeps us young too! Fresh local produce is better for you – because nutritional value is at its’ peak when food is freshest. Much of the food in your local grocery store has travelled for days before reaching store shelves and thus lacks freshness. Organic produce doesn’t have any of the toxic chemicals of industrialized foods that researchers suggest may be contributing to today’s chronic diseases such as cancer, diabetes and heart disease plus a broad spectrum of modern childhood maladies such as allergies, asthma, ADHD and Autism. Organic food really is healthier for you – and more delicious. This is because the soil used in Organic Farming includes more microbes and minerals, which become part of the vegetables that grow in that soil. 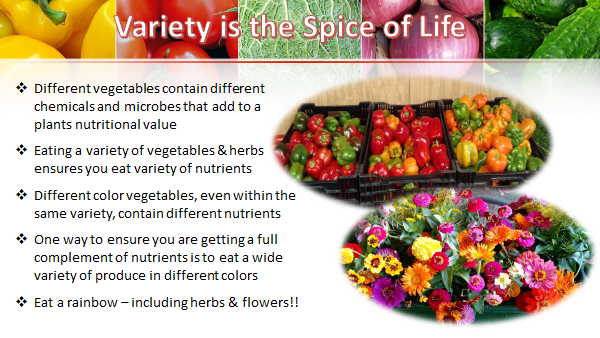 These microbes and minerals contribute to immune system, gastrointestinal, and cellular health. There is also some research that suggests that these same microbes and minerals add flavor and depth to the taste of organic vegetables making them more delicious. Preparing meals at home allows you, the cook, to use healthier, chemical-free ingredient and preparation choices – decreasing salt & sugar, using healthy food preparation techniques such as roasting and baking instead of frying, and increasing healthy food choices to include more plant based foods. It also makes a goal of eating the five servings of plant based foods easier to accomplish. Increasing the amount of whole plant based foods in your diet is recommended for everyone – with corresponding decreases in animal based products, processed foods high in sugar, salt, fat and chemical additives and less healthy forms of plant based foods such as fruit juices. Most Americans do NOT get enough of many vitamins, minerals and dietary fiber – which can be addressed by adding dark, leafy greens, legumes and other nutrient rich vegetables and lean proteins to the diet. Over the next few months, Yellow Stonehouse Farm will be writing and posting our Blog – Farming Matters – on our Website – www.yellowstonehousefarmcsa.com/ and also on our Facebook Page of the same name . We may also link to other Community Facebook pages. Please feel free to share with your own Facebook Community and to respond with questions and comments. We’d like to start a dialogue on Healthy Eating and Living with the community here in Western MA and would appreciate your input. I’ll be posting about our CSA and other ideas we think are important regarding Healthy Eating and Organic Farming but would like your suggestions on topics you are interested in. For more information on Yellow Stonehouse Farm and our CSA memberships go to www.yellowstnehousefarmcsa.com/ or call the farm at 413-562-2164. 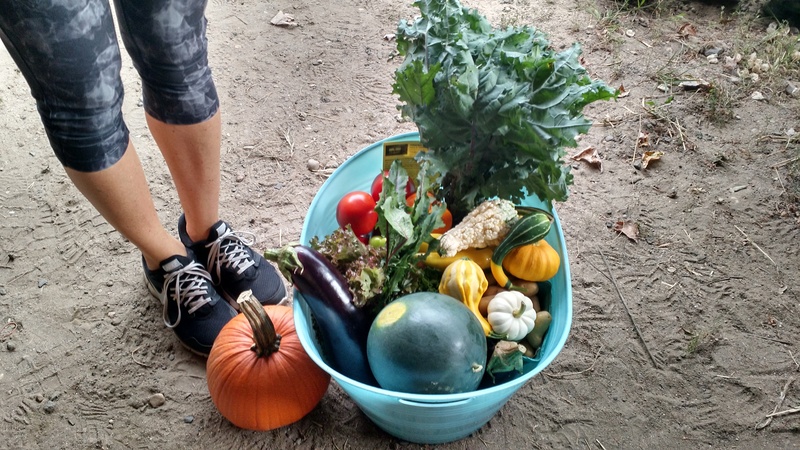 A blog by Connie Adams – co-owner, with husband John, of Yellow Stonehouse Farm, an USDA Certified Organic Vegetable CSA located in Westfield, MA. I hope this picture of our farm from last May helps ward off the persistant winter chill we are experiencing in New England this March. It’s unsatisfactory after the warm weather teased in February. It’s true what they say about New England weather – the only thing you can count on is it’s unpredicatability. 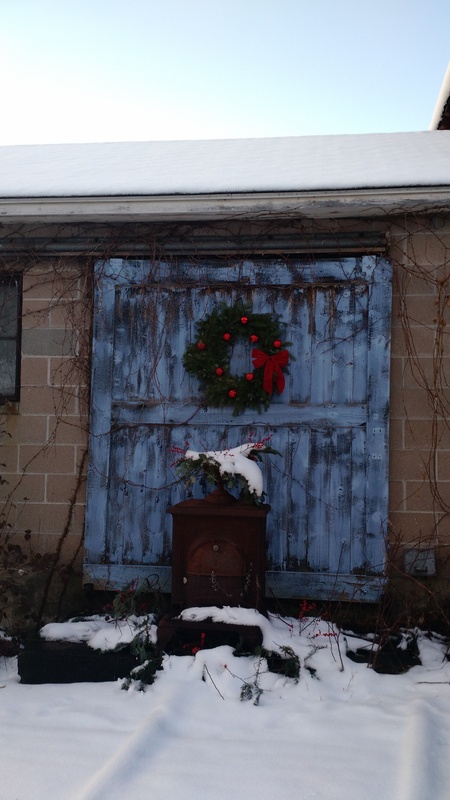 Thankfully, most farm activities this time of year happen in-doors. We’re getting ready for the growing season, deciding what to plant, laying out the rows and deciding where we are going to grow the different crops, figuring out how much of any one thing to grow, and studying dozens of catalogs to pick new and different, as well as tried and true, varieties of vegetables, flowers and herbs. We are even start ing seeds for plants that have a long propogation time – like leeks and kohlrabi. 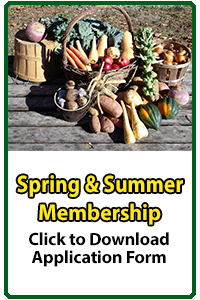 This is also the time of year for members to sign up for our Spring/Summer CSA. 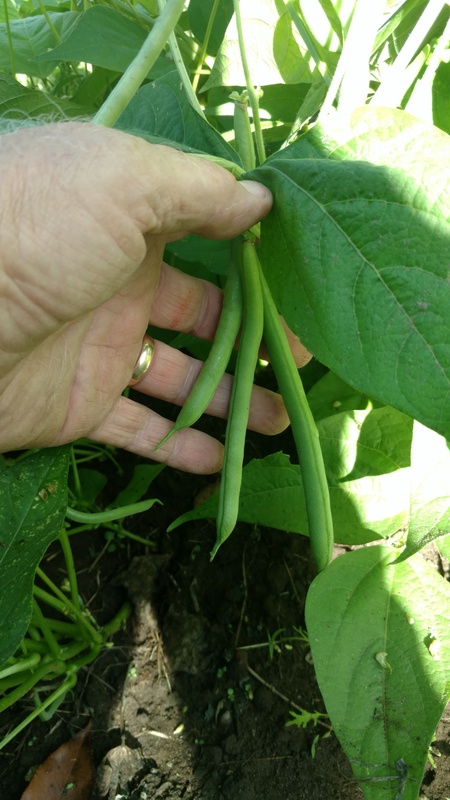 CSA members are the ones we are planting for, and we try very hard to make sure that we have enough variety to satisfy the most adventuresome of eaters. If there is a vegetable (or flower or herb) you would like us to grow for you as part of your membership, please email us to let us know. 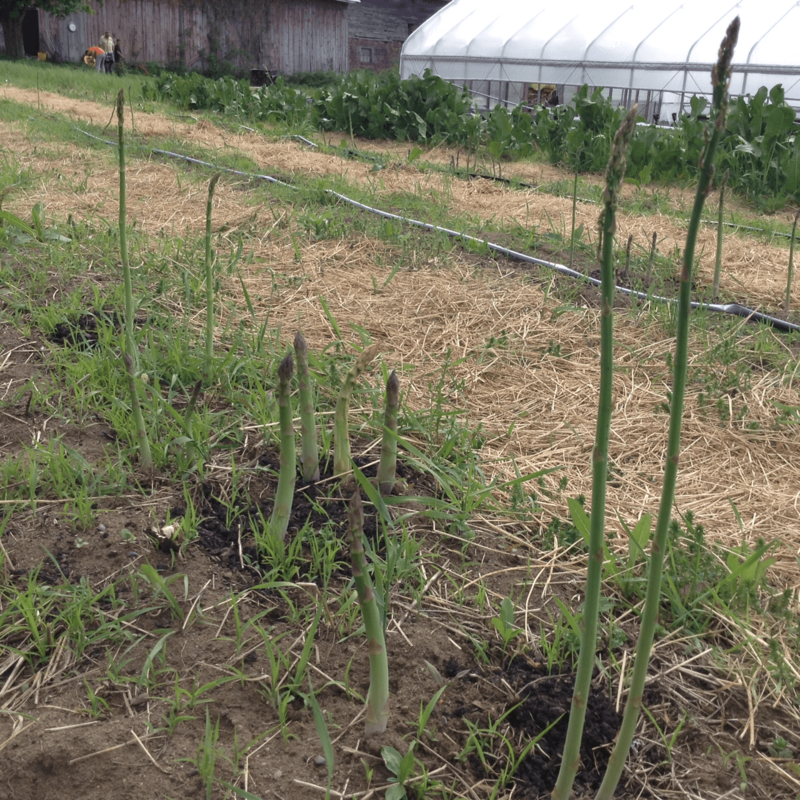 Regarding Yellow Stonehouse Farm CSA memberships – we are delighted to welcome a number of new CSA members! Welcome all, we are very happy to have your join our farm family. We look forward to sharing the bounty of our harvest and the beauty of our farm with you and yours. Many of these new CSA shareholders were referred to us by our present members – thanks to all for being so supportive. Providing the best experience possible to our members is our primary mission – and your recommendations validate our efforts. For those considering 2017 CSA membership in our farm, we urge you to sign up soon. Some popular pick-up days (Wednesday and Saturday) are fast becoming fully subscribed, and we only have a fixed number of shares available. Providing fresh, local, and USDA certified organic vegetables to the local community is something that John and I are both committed to – but it’s the CSA community that we’ve become a part of that makes the work so rewarding for us and our members. We look forward to expanding our farm family to include many more neighbors and friends from Westfield, Southampton, the Hill Towns and surrounding area during the upcoming 2017 season.